While I was building my differential active crossover to match my homebrew Vacuum State RTP3 preamplifier, I started looking for a power amplifier design to replace the ageing Croft Series 5 which supplies midrange	and treble power to my semi-active speakers. This has given me great service for nearly twenty years, and in my opinion was one of the greatest bargains in audio. I know it can be beaten (a few years ago an Audio Note Oto certainly sounded more transparent and neutral), and I was getting to the stage where I needed to decide whether to change all the valves or replace the amplifier. Since I had never built a valve power amplifier before, I couldn't resist the DIY option. My priorities in audio have changed over the years, and I wanted to build an amplifier with a similar design philosophy to my recent projects: differential operation, and preferably no overall negative feedback. Why do I consider these aspects important? Differential operation is an extension to the balanced principle often used in professional audio. In a differential circuit there is no internal signal ground reference: each stage of the the circuit only cares about the difference between the hot and cold inputs it receives. This cancels the common mode input noise (as does a normal balanced circuit) and also partly the internal noise generated by the circuit but, just as importantly, draws a constant current from the power supply, so vastly improving power supply rejection, and increasing the dynamic range. I already have balanced outputs on my differential preamp and crossover, so it made sense to build a compatible power amplifier. Negative feedback, used in almost every commercial amplifier (and many DIY kits) on the market, reduces the total harmonic distortion under steady state conditions and gives a lower output impedance. Doing away with it, on the other hand, brings the advantages of cleaner behaviour under clipping, a more natural harmonic distortion spectrum (dominated by second or third harmonics, with very low amounts of harmonics higher than fifth in a well-designed circuit) and less of a tendency to demodulate any radio frequency noise injected into the output of the circuit. Throwing away this "crutch" does demand, though, that the active devices are much more linear (read "more expensive"!). Most of the devices used in amplifier output stages are intrinsically seriously non-linear; the worst of all are transistors (both bipolar and FET) which are almost always used inside a global feedback loop for this very reason. Even tetrode and pentode valves have pretty non-linear gain with voltage and current, which is the reason that they are again normally used with negative feedback, and this is the case with the EL84s in my Croft. The natural choice, therefore, is triode valves, and in particular directly-heated triodes such as the 300B, 211 and 845, for the output devices. A potentially significant consequence of feedback-free amplifiers is that the output impedance can be several ohms so, to avoid the frequency response being unduly affected by the varying impedance of the loudspeakers, careful matching of the power valves, output transformers and speakers is vital. Despite these potential disadvantages, the few amplifiers I have heard that have not used global negative feedback have had a naturalness and directness to their sound, as well as a very convincing representation of instrumental timbre, and my experience seems to agree with the consensus of others "out there". Martin Colloms has some interesting things to say about negative feedback, as does Kevin Kennedy. Besides, my preamp and crossover use no global feedback, so it made sense to find a power amplifier to match. I wanted an output power of 20-30W and a gain of 20-26dB, as I knew that my Croft parallel EL84 amps fit in well with my system, particularly with my 90dB/1m/1W speakers. This ruled out single-ended operation, as the abysmal efficiency of this type of circuit produces output powers of 10W or less, along with peculiarities like asymmetric output impedance, even though these designs can sound sublime with carefully chosen music through the right speakers. Other preferences included reliability and the requirement for easily available (and not extortionately expensive) valves in current production. For safety reasons, I didn't want to use exotic valves like the 845 that need a kilovolt or more of HT supply. A definite priority was a proven design with a full parts list - I tend to make the odd change when I build someone else's circuit, but I also like to know exactly what the original intention was. I have always had a deep repect for Audio Research equipment. When I used to go to hi-fi shows a few years ago I was always impressed by systems based around ARC preamps and amplifiers, and everything I have seen of theirs has been superbly built. Manfred Persson's Audio Research information pages have an impressive amount of information on pretty much everything the company has ever released, including for many models full schematics and internal photographs. The Classic series of amplifiers had 6550 beam tetrode output valves, strapped into triode mode, and an architecture that has some aspects of differential operation: they can be easily modified to take a balanced input, although the input stages are not strictly differential. The ARC VT series (for instance the VT100) are closer to being differential, having a long-tailed pair (with MOSFET constant-current sinks in the tails) in both the input and driver stages. However, like the Classics, the VT amplifiers use global feedback to reduce distortion and output impedance, and the Classics in particular use JFETs as the input voltage amplifiers, and these days I am trying to avoid both of these. I actually got some way into building a near-clone of the Classic 30 a few years ago, but eventually realised that it wasn't really what I was looking for, and before I spent serious money on glassware and transformers I decided to cut my losses. for a while, picking up ideas. There is a bewildering variety of circuits and design philosophies out there, but I was looking for a good track record from the designer, and a certain elusive elegance and beauty of design. I don't remember exactly what it was that drew me to Kevin Kennedy's pages, but when I read about the push-pull 300B circuit on his amplifier projects page, even without seeing the circuit, I thought "That's it!". Kevin is well regarded in the DIY audio community, particularly for his renovations of vintage amplifiers including Dynaco and Harmon Kardon Citation IIs. His push-pull amplifier (he also publishes a single-ended 300B design, as well as several preamps) is an elegantly simple differential circuit, using 6SL7 dual octal-base triodes in the input stage and 6SN7 as drivers. The rated power output, depending on the output transformer, is 25-30W. It has a relatively high output impedance, as is typical of circuits without negative feedback: Kevin notes here that "the damping factor... is about 2.2 on an 8-ohm tap with an 8-ohm load". The use of push-pull 300B output valves in a differential amplifier circuit appears to have been popular for some time in the Japanese audiophile community (that is where the renaissance of directly heated triodes started, after all), but is relatively new in Europe and North America. Kevin claims that his is the first such design to use heavily regulated power supplies throughout. The amplifier is built as a pair of monoblocks, and the number of valves and transformers for each channel means that each chassis is both bulky and heavy! Each channel weighs in at a substantial 20kg. 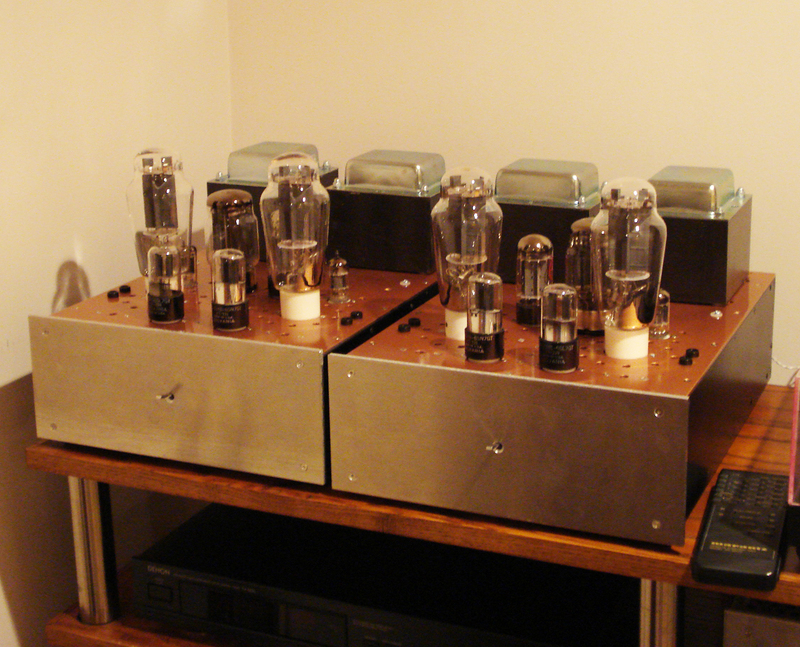 The picture on Kevin's blog page shows a pair with the valves and connectors for the two channels arranged in mirror-image, rather than having identical layout for the two monoblocks, which is a nice touch. The main advantage of this, apart from the aesthetic one, is that if the wiring inside is routed with low-level signal circuits on one side of the chassis and mains AC on the other, there is minimal hum pickup when the two monoblocks are placed side by side. Kevin's priorities in audio reproduction seem to correspond pretty squarely with my own: neutrality, detail, natural dynamics and a sound that is not fatiguing in the long term. These are also the aspects of the performance of my Funk Firm modified Pink Triangle record deck and Vacuum State preamplifier which I particularly value. The use of very linear triode valves in a simple signal circuit, as well as the work that has gone into the power supplies, suggests that this amplifier ought to sound very good indeed. The boxes for the monoblocs are put together in a very similar way to my RTP3 preamp and differential active crossover with 3mm sheet 5083-alloy aluminium for the top, rear and sides, and a 5mm aluminium front panel. The panels are joined along the edges with 8mm square-section aluminimum stock which, along with the corner braces underneath which support the feet, makes quite a robust structure. The overall dimensions are 390mm x 280mm x 100mm, which is a little shorter and wider than Kevin's prototype, as described in the VTV article. There is no base; a bottom cover would be obligatory for safety reasons in a commercial unit, but I left it out for convenient access to the internals, to increase ventilation and to help avoid unwanted resonances. There should be no safety implications as long as the amplifier remains sitting securely on a shelf. I made the rectangular holes for the two big transformers by drilling pilot holes at the corners and then using a hacksaw to cut between the holes, finally finishing off with the flat side of a half-round file. I cut out the holes for the B9A valves with a 22mm hole punch, while I was surprised to find that ordinary Draper holesaws worked very satisfactorily for the larger valve sockets (23mm and 32mm for the octal and 300B sockets, respectively), even through the 3mm aluminium plate. I was originally planning to clear anodise the chassis, as I like the understated look of equipment like the Vacuum State DPA-300B. When I started looking around for local anodisers, though, I discovered that they are a vanishing resource around here. I thought briefly about trying to do it at home (I anodised the knobs for my solid state preamp project myself), but quick calculations told me that I would need something like thirty amps for each of the top plates, which would heat up anything less than a big tub of acid pretty quickly. I slept on it for a couple of nights, then made a complete aesthetic about-turn and decided to use the classic Japanese Audio Note look, with their distinctive combination of lacquered copper and black enamel (for example, the Gakuon and Gakuoh), as my model. Since I had already put together the aluminium chassis (and previous experience had taught me that copper is rather harder to work with than aluminium anyway), I decided that to get the lustrous look of the Japanese amplifiers I would have to cheat. I applied a couple of coats of Plastikote "Copper" spray paint to the top panels after priming, and then finished with two coats of automotive clear lacquer. I am rather pleased with the results - close examination reveals the slightly speckly appearance of the metallic paint, but from a distance the finish is fine and convincingly coppery. The side and rear panels are sprayed satin black. 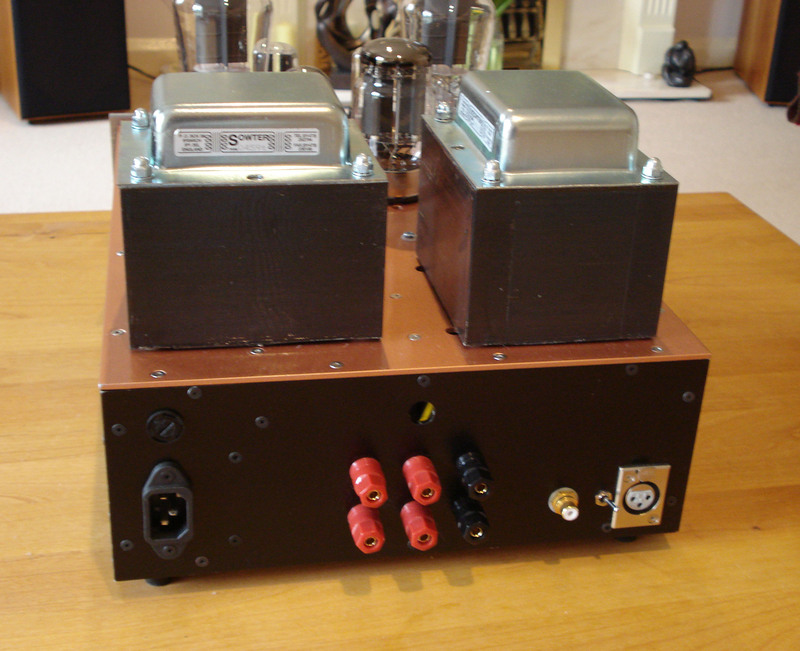 The identical dimensions of the Sowter mains and output transformers allow them to sit side by side along the rear of the amplifier, so the top layout is a little different from that of Kevin's prototype (although I decided part way through building to rotate the output transformer to reduce hum coupling from the mains transformer). The rectifier and regulator valves (four in all) are now lined up in front of the big transformers, which rationalises the connections between them by avoiding the large separation between the 6336A and 12AX7 in the HT regulator in the original. Another difference from Kevin's original is that I have installed the input connectors on the rear panel, rather than on the front. I appreciate Kevin's logical argument that the latter arrangement isolates the line-level connections from the mains wiring, and hence reduces the possibility of hum, but cables at the front of my power amps would be unacceptably messy. Most of the crucial parts (the valve sockets, bridge rectifiers and regulators) are bolted onto the top plate, so most of the wiring can be done directly between them, but I also used several of Maplin's 5-way tag strips for mounting, particularly for the big film capacitors and for terminating some of the leads from the transformers. The bias adjustment pots I used are not lockable, so to avoid accidental misadjustment I made up some small brackets to allow the pots to be entirely contained inside the chassis: the screw slots on the ends of the pot shafts are now recessed one or two millimetres below the top plate of the amplifier, but still accessible with a screwdriver. I originally planned to put the mains switch by the edge of the top plate, about halfway to the back, to keep the mains AC away from the input stage, but in the end I decided to use a switch on the front panel to activate a 6V DC relay at the rear. This ensures that there is no AC at all in the front half of the box, while retaining the convenience of an on-off switch at the front, away from the hot valves. I had to mount the extra 6-0-6V transformer for the relay supply on the back panel next to the mains input, as there was no space left anywhere else in the rear half of the box! There is a faint hum from the latter transformer while the amp is in standby - I will put some damping and/or decoupling in at some point, but this is not really a problem. Everything in the amplifier is hard-wired, with the signal grounds connected to a star point towards the rear of the box with 0.7mm 99.99% silver wire insulated with PTFE sleeving, and the input connectors are wired to the 6SL7 grids with twisted PTFE-insulated silver plated copper wire. The HT and -200V wiring is with stranded polyethylene-coated wire, with the +400V HT ones further insulated with red mains-rated sleeving for extra security. Other local connections are made with tinned solid-core copper, insulated where needed with PTFE sleeving. The star ground is connected to the mains earth and the chassis via a 100R resistor in parallel with a bridge rectifier with + and - shorted. In Kevin's original article the 300Bs were described as being heated by 5VAC, but Kevin told me that in the longer run it was impossible to get good enough AC balance to banish hum as the parameters of the 300Bs drifted with time. He now recommends DC heating for the output valves, and suggested a current regulated supply for the 1.2A or so required for each output valve. Following his suggestion, I am using an LT1085CT connected as a current regulator for each filament, each being fed from a separate 9V winding on an 80VA toroidal transformer. Here is a discussion on the Tube DIY Asylum of regulated filament supplies for the 300B. I have also used a pair of 25 ohm resistors ( made up of four 100 ohm resistors in parallel) to form a centre point for the cathode, and this is what I connect to the 10 ohm current sensing resistor, rather than one end of the filament: this ensures that the signal voltage is not present across the LM317 regulator, which seems good practice. A minor change to Kevin's design was to use a separate LM317T regulator for each of the two octal signal valves, instead of the single LT1085 supplying both 6SL7 and 6SN7 in the original circuit. I did this to spread out the heat dissipation across the top plate a little: the single regulator in the original, supplying 900mA to the two filaments, dissipates about six watts. and the anode resistor on the 12AX7 in the same circuit is reduced from 301K to 164K (two 82K 2W resistors in series). The only thing I don't like about Kevin's circuit is that there are no bleed resistors to ensure the power supply capacitors discharge safely after switch-off, which is a surprising omission in a DIY project. Neither the +400V nor the -200V regulators have any discharge path for the reservoir caps apart from through the regulator valves, which of course become open-circuit shortly after the power is removed from their heaters. I added two 220K 2W resistors in series across the second 50uF cap in the HT supply and 470K across the first 50uF cap in the bias supply, just to make sure I wouldn't get any nasty surprises. I used standard Maplin 1% metal film resistors in most places, as I did with the RTP3, using 0.6W or 2W parts as appropriate. The 30K anode resistors on the 6SN7s are made up of four 120K 2W in parallel. The 0.22 uF coupling capacitors are 630V SCR polypropylene and tinfoil, equivalent to the Mundorf KP-SN I used in my preamp and crossover. Power supply and smoothing caps are Solen or SCR metallised polypropylenes, while the electrolytic reservoir capacitors in the bias supply are generic 450V types. The valves are an eclectic mixture of vintage and new: the two 6336A are almost as old as I am, while the Sylvanias are (only just) post-war! I decided on Sowter for the output and the largest mains transformers, even though these are not cheap; they have a high reputation for quality and service, and will make up custom designs to order. I used the U070: 4,500 ohm primary, 4 and 8 ohm secondary, primary inductance 106H, and a 100W power rating. This one seems the best suited of the current Sowter range; it has a higher primary impedance than the 3,500 ohms suggested in the VTV article, which will give a slightly reduced power output, compared with the original specifications (Kevin estimates about 25W), but the benefits of slightly lower distortion and output impedance. and an 80VA 0-9V, 0-9V toroid for the 300B filaments. The 5H 250mA HT choke is the VTL111100 from Variable Voltage Technology. I measured its DC resistance as 58 ohms, so it doesn't quite satisfy Kevin's recommendation for a resistance less than 50 ohms, but it should work fine: the extra voltage drop is 1.4V at 170mA. When I showed a photo of the unfinished chassis to Kevin, his first comment was that the main power transformer and the output transformer were possibly too close together, which risked hum pickup. He suggested that I check this by powering up the amplifier with the primary disconnected from the HT and checking the AC voltage on the secondary with a DVM or a spare pair of speakers. With the primary unloaded I found about 4mV on the output, and with 750 ohms on each primary winding (simulating the anode resistance of the 300B) I got about 1mV. This resulted in a barely audible hum in the 92dB HM210Z0 woofers of my main speakers; although I could live with this, I suspected that other sources of hum (pickup in the signal wires, for instance) would add to this, so I took Kevin's advice and rotated the output transformers through ninety degrees, which reduced this baseline hum to inaudibility. When I connected it up to my system, I found hum levels were rather lower than with the Croft it replaced, and I suspect that the fact that the system is now differential throughout results in cancellation of most of the noise pickup. I found that the 100V zener diodes in the HT and bias regulators all measured three or four percent higher voltage than the nominal value, so I trimmed the series resistors in the feedback legs to reduce the output voltage. The HT and bias supplies are now within a volt of their nominal values. The anode voltages on the 6SL7s in the input stage determine the operating points of the 6SN7 drivers, and Kevin's article suggests that these should measure 105V, within about 5V. Mine initially measured between 95V and 101V, with a difference of 4-5V between the anodes of each valve, which suggests a slightly less than ideal balancing of the 6SL7s. I added an extra 2.4K in series with the 100K resistors on the tails of the input valves, which brought the anodes much closer on average to the optimum DC levels, but obviously didn't improve the differences within each 6SL7. Kevin recommends about 300V on the anodes of the 6SN7 drivers, and mine now lie between 290V and 310V; he feels this is marginally adequate for optimal voltage swing, and suggests that in the longer term I might want to find some better matched and balanced 6SL7s, but I will stick with what I have for now. The measured gain of my amplifiers is well matched between channels: with a differential input of 100mV at about 1kHz I measured 1.20V and 1.19V at the 8 ohm outputs of the two amplifiers, which works out at 27.6dB relative to an input of 0.05V at each input: Kevin quotes a gain of 26dB in differential mode, so mine has a slightly higher gain than his. I don't own an oscilloscope, so I couldn't verify his quoted signal swings at the 6SN7 anodes, but my DC readings suggest that his recommended swings of 170V P-P should be possible. One amp worked fine when I connected it to my system, but I had problems with the other: about a minute after switch-on, about half the time there was a purple flash from the GZ34 rectifier and the mains fuse blew. Several fuses later, I came to the conclusion that the rectifier was faulty, and ordered a couple of replacements. Once I put a new GZ34 in, the amp functioned perfectly. What do the 300Bs sound like? The two 300B monoblocs replaced the stereo Croft Series 5 (push-pull parallel ultralinear EL84), driving the midrange and treble of my semi-active DIY speakers; so far I have only used the 8 ohm outputs. Replacing the Crofts resulted in the biggest change in sound I have experienced since I first installed my DIY speakers into my system. I had a feeling that the nearly twenty-year-old Crofts were starting to sound a little tired and dull, and the 300Bs certainly sounded very fresh and vibrant by comparison. I started off with CDs: firstly a "best of" collection of Tracy Chapman, and then Melody Gardot's One and Only Thrill, a current favourite. Both singers were projected almost disconcertingly vividly into the room: the "grain" of their voices was much more evident, and they seemed much more like living and breathing people than before. Even with the CD medium, there seemed to be more space around the singers and between the various instruments, so that the performing space grew right out into the listing room and away from the speakers. I have read all these cliches in magazines, but not experienced it with in my own home before! There was also a big improvement dynamically: the lower gain of the 300B amps meant that I was having to use higher volume settings, but in fact the vibrancy of the perfomances meant that direct comparison of volume levels with what I was used to was difficult, if not irrelevant. I am still in the early stages right now of getting used to the changes in sound in my system and, as usually happens when I first install a freshly finished DIY component, it takes me a while to start to relax and let go of the expectation that something is suddenly going to die with a flash and a pop. In an attempt to settle myself down a little, I put on an old favourite: Ravel's Rapsodie Espagnole and his Menuet Antique, conducted by Bernard Haitink on a Philips LP. Unfortunately, although the strings shimmered and the woodwinds were represented with great beauty, the power of the tutti climaxes took me by surprise each time, leaving me quite excited and unable to relax, despite the late hour. I am amazed that replacing an amplifier which is only required to pass signals above 500Hz with another one, with an almost identical power rating, can make the whole system sound markedly more powerful! I could only counter this stimulation with a return to CD, this time Ry Cooder and Vishwar Mohan Bhatt's supremely mellow but involving A Meeting by the River, which sounded absolutely gorgeous. I am particularly impressed by the amount of detail that this expanded image reveals, particularly on vinyl. For example, I noticed for the first time that Leonard Cohen's Last Year's Man has a group of girls singing behind Cohen, where before I had assumed there was only one voice. Listening to Bach's Art of Fugue, played by the Leipzig Bach Collegium, there were occasional rustling noises, which I first thought were noisy valves, but after a while realised was the musicians turning the pages of their scores! Kevin has remarked that his amplifier designs, with their regulated power supplies, stabilise relatively quickly after switch-on. I haven't had the 300Bs on for much longer than an hour or two at a time yet, mainly because of the amount of heat given off, but I have noticed a small but definite improvement in sound quality over the first half-hour. This is noticeable more in the potentially excellent timbre resolution and imaging of the amplifier than any obvious change in bass power or frequency response. An an example, I put on Joni Mitchell's strikingly original Hissing of Summer Lawns on LP about ten minutes after switching the amps on (my RTP3 had already been on for a couple of hours). To start with, everything sounded fine, but by the end of the side I could hear much more textural detail and instrumental colour, and there seemed to be a lot more "air" around the instruments and the multi-tracked voices. Kevin Kennedy's own site, Kennedy Tube Audio. There is a blog on Kevin's site, discussing some of the motivations for this design. The original 1999 article from Vacuum Tube Valley on the PP300B amplifier, published as a Svetlana Technical Bulletin. Fuller details, including schematics and parts lists, are in an article available from lulu.com (well worth the nominal price). There was at one time a commercial version of Kevin's PP 300B amplifier, built by ACS in Hong Kong: here is a review on the Audio Asylum of the ACS STA-3030. This was a stereo amplifier with power supplies shared between the two channels, unlike the monoblock design described here. It also uses a different valve set, and in particular seems to be missing the 6336A and 6U8A regulator valves, which implies that this version either has solid state regulation or has unregulated supplies. The Tubelab version of the PP300B amplifier. A brief discussion of the bandwidth issues of the PP 300B circuit on the DIY Asylum. Another AA thread on the PP 300B; one poster suggests some modifications to improve the drive capability over the original design, and so increase the bandwidth. 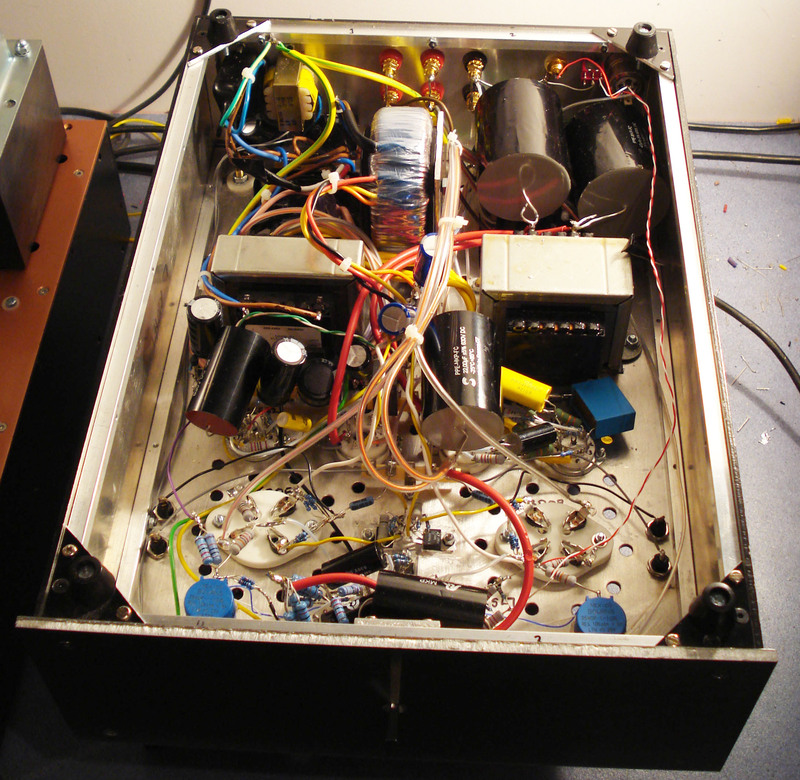 A thread in the DIY Audio forum on valve regulation in amplifiers. Kevin contributes some interesting comments. A link to Kevin's system photos on DIYAudio. A review of current 300B makes on TNT-Audio. Another 300B survey on the Enjoy the Music site. ... and yet another comparative review of 300Bs at Stereophile Magazine. Discussion in the DIY Audio forum on 300B types. A similar circuit by Satoru Kobayashi from MJ magazine, which adds a 5687 cathode follower to the driver stage to increase the drive capacity. Another amplifier using push-pull 300B/6SL7/6SN7, the Audio Space 6M: there are interesting reviews and descriptions on the Enjoy the Music site and in Hi-Fi Review. Review of the Japanese Sun Audio SV-300B by the outrageously entertaining (and sadly late) Harvey Rosenberg. I get the impression that using 300B in push-pull mode with 6SN7 drivers is a popular circuit in Japan, although the the Sun amplifier has only a single driver and uses a transformer phase splitter. Anyway, Gizmo seems to like it! Here is an article on the Sun Audio 300B PP. Although all the links are in Korean, the text is in English, and there is also a circuit for the amplifier. A review of the Manley Neo-Classic SE/PP 300B, which is intriguingly switchable between push-pull and single-ended operation. The Mingda Meixing MC300C amplifier, which looks very like Kevin's amplifier, including the driver valves, though it doesn't have the valve voltage regulation or the balanced input. The Canary Audio CA-301, and a review of it on Positive Feedback Online. A quite outrageous push-pull 300B amplifier with 300B drivers and a whole shed-load of transformers, by the legendary Susumu Sakuma. The Axiom 300B amplifier, with some interesting and idiosyncratic design details. 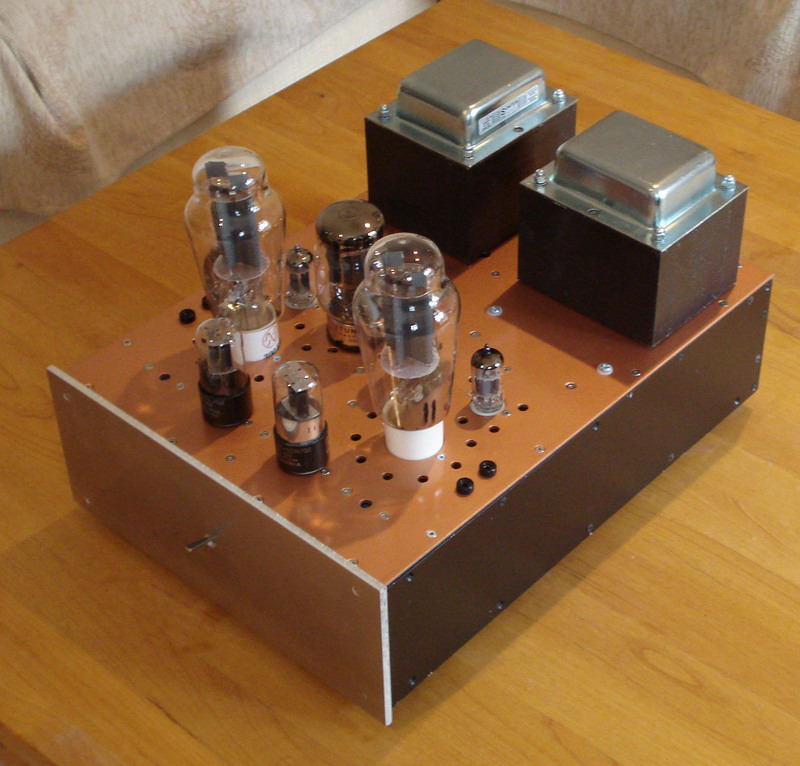 Herb Reichert's purist Flesh and Blood single-ended 300B amplifier. 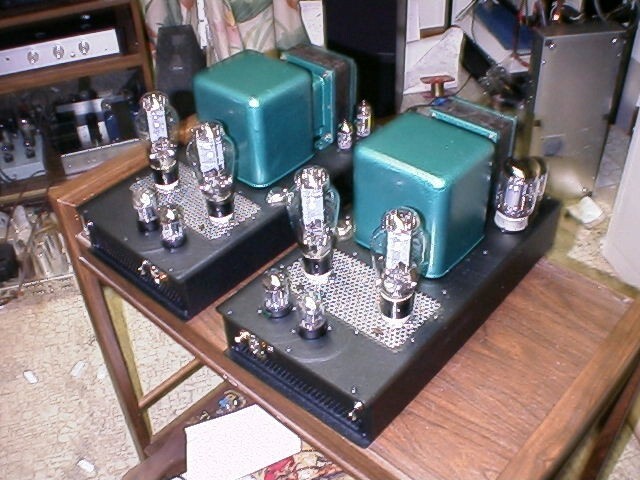 Some photos of various 300B DIY amplifier projects, some of them very attractive! An interesting discussion on 300B amplifiers on Audiocircle. There is a 300B amplifier project circuit in a Hi-Fi World DIY Supplement (issues 4 amd 5), designed by Tim de Paravicini, no less. It has 12AX7 and 12AU7 input valves in a single-ended circuit and a transformer phase splitter, and uses unregulated HT supplies. The circuit isn't available on the Web, as far as I know, but there is a discussion on it here. I understand that the design was subsequently modified by Andy Grove (later of Audio Note UK) who removed the interstage transformer, but I only have the original articles. An explanation, again by Lynn Olson, of the Western Electric 92A amplifier, from back in 1935. The 92A has push-pull 300B output valves and also uses the cross-coupling trick Kevin mentions to cancel miller capacitance. Yet another interesting and informative article by Lynn, on why he uses transformer coupling in his circuits. A discussion in DIYAudio.com on 300B amplifier circuits. Another discussion, on the Tube DIY Asylum, of push-pull options using 2A3 and 300B valves. A helpful definition of output stage "classes" of valve amplifiers (the push-pull 300B is AB1, by the way). Some discussion of 6SL7 types, and some more here. Discussion, again on the Tube DIY Asylum, of the appropriate output transformer impedance for a pair of 300B valves in push-pull. Michael's Electronics Emporium, an e-bay based supplier with a good range of valves and related items. I bought the pair of 6336A for this project here. I bought the valve sockets from the Hi-Fi Collective - good service and good stock of parts, although perhaps a little pricey. I can recommend Vintage Hi-Fi in Italy, who supplied most of the polypropylene caps. Very prompt service and the lowest prices I could find! Sowter's output transformers for push-pull amplifiers and mains transformers. I bought the 5mH chokes from Variable Voltage Technology Ltd, a small company on the Isle of Wight who specialise in transformers and chokes. Langrex in Sussex: I bought the NOS octal signal valves from there: faultless service and next-day delivery. BTB Electronics in Nurnberg, Germany, who have good prices and excellent service. I bought the JJ 300B valves, as well as the EH GZ34 and JJ ECF82 from them. Click Metal in Chandlers Ford, who supply sheet (and other) metal by mail order. I bought the aluminium sheet for this project ffrom Click, and was very pleased with the service. Kevin Kennedy has given me far more advice on this project than a non-paying customer like me can sensibly expect!